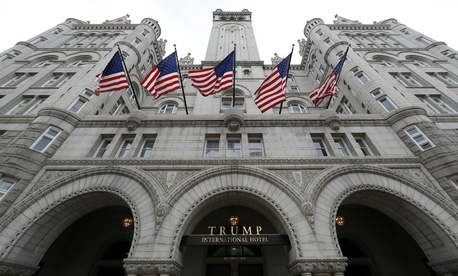 The 18 Democrats, led by committee ranking member Elijah Cummings, D-Md., wrote separate letters to 23 agencies seeking documents relating to expenditures by any entity within the agency “to the Trump Organization or president’s trust,” a reference to the legal entity Trump set up in January that allows his adult children to continue running his vast hotel, golf course and luxury product business holdings. They also demanded documents on expenditures “to any business in which the Trump Organization has an ownership stake” as well as any payments associated with any travel undertaken by any member of the Trump family to promote a business in which the Trump organization has a stake. Trump’s unprecedented arrangements have drawn complaints from the Office of Government Ethics and lawsuits from nonprofits claiming conflicts of interest and possible violations of the Constitution’s Emoluments Clause. The lawmakers cited an array of media reports about the costs of Trump’s frequent visits to his Florida property at Mar-A-Lago and his hotel in Bedminster, N.J., where he is currently spending his 17-day working vacation. Also footnoted are the federal housing assistance payments Trump receives as part of his 4 percent interest in the largest federal subsidized housing project, Starrett City Associates in Brooklyn. Politico has estimated that each presidential trip to Mar-a-Lago costs $3 million. “The Trump administration has not disclosed the total amount of federal expenditures associated with his trips to Mar-a-Lago, Bedminster—or any properties he owns—and it has not disclosed whether expenditures by the federal government were paid to the president’s properties or whether the president benefited financially from these expenditures,” the letter stated. The members requested responses by Aug. 25 from the departments of Agriculture, Commerce, Defense, Education, Energy, Health and Human Services, Homeland Security (which includes the Secret Service), Housing and Urban Development, Interior, Justice, Labor, State, Treasury and Veterans Affairs, along with the Environmental Protection Agency, NASA, U.S. Agency for International Development, National Science Foundation, Nuclear Regulatory Commission, Office of Personnel Management, Small Business Administration and Social Security Administration. They warned there may be other unreported expenditures that benefit Trump. “Federal agencies and their employees may be hosting events or renting hotel rooms on Trump properties, eating meals at Trump property restaurants, or contracting for equipment rentals at Trump businesses,” the Democratic lawmakers wrote, with a “CC” to House Oversight and Government Reform Committee Chairman Rep. Trey Gowdy, R-S.C. Under Trump, agencies have been following a policy of providing documents only to committee chairmen. The White House did not respond to requests for comment by publication time.